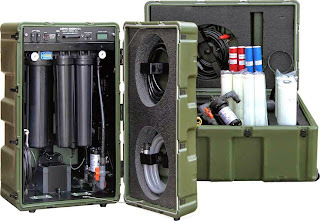 Aspen Water purification systems produce more water with less power than any other portable water purification system on the planet. Water can be drawn from virtually any water source including sea water, ditches, ponds, rivers, lakes, swimming pools or standing water that may contain chemical and biological contamination. Aspen Water systems are made in the USA, and its corporate headquarters are located in Richardson, Texas. 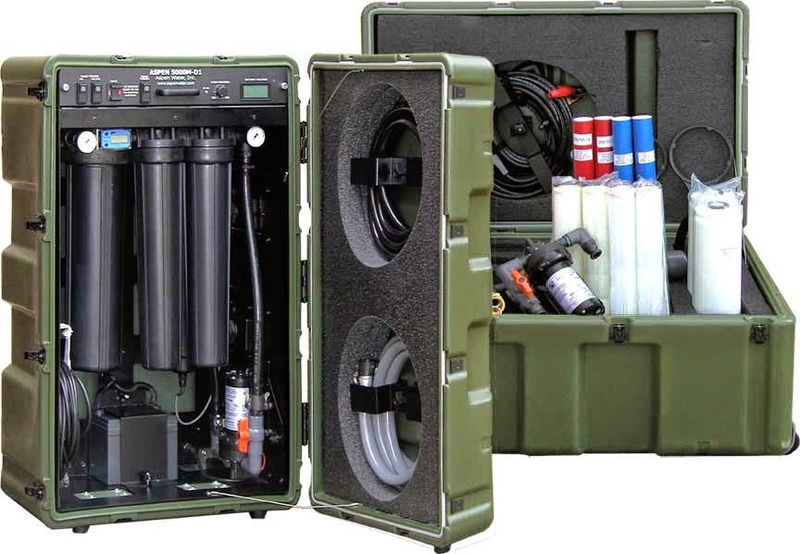 Aspen Water Products are available thru GSA Advantage, used by the U.S. Military and disaster relief organizations around the world, and have proven themselves under some of the most demanding an extreme conditions, including field testing at the Aberdeen Proving Grounds. The Aspen 2000DM is the most compact, versatile, full featured, computer controlled, energy efficient, mobile reverse osmosis system available today. All internal mechanical systems are mounted on a strong lightweight aluminum frame enclosed in a ruggedized military style case. The 2000DM utilizes water sources ranging from fresh surface or well water to heavy sea (salt) water. 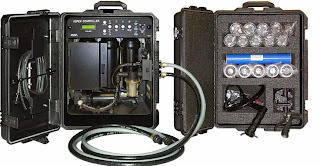 This versatility comes from a unique pumping and injection system, with a variable recovery rate, producing the maximum product flow from the feed water. 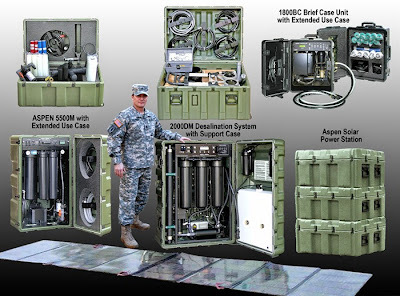 The ASPEN 10,000CM water purification system will supply 8,500 to 10,000 gallons per day (between 300 and 400 gallons per hour) of highly purified water from virtually any non-saline water source. Water can be drawn from ditches, ponds, rivers, lakes or standing water that may contain chemical and biological contamination.